With the Farewell to Arms update, Dodge Roll is officially done creating new content for Enter the Gungeon. They'll release patches and tweaks, but the game is now considered content complete. After such a huge success, many are wondering why Dodge Roll has decided to move on. Dev Dave Crooks was asked that very question by PCGamesInsider, and you can check out his answer below. Creative and technical fatigue. After five years of developing Enter the Gungeon, with many interesting and potentially creatively fulfilling ideas and opportunities passed on, combined with increasingly annoying technical slogs to get new features working without generating new bugs, we just needed to move on to stay happy, to stay productive, and to stay sane. Gungeon is a game where, by design, everything interacts with everything else, and everything is decided at runtime. All new content had to play well and not break countless other decisions that had been architected in different development “eras.” We couldn’t just add Orbit Bullets for example; they had to interact nicely with 8 fundamentally different weapon categories, companions that shoot fundamentally different kinds of bullets, and other complicated bullet movement modifiers like Helix Bullets. New content had to be interesting, had to be different and worthwhile; with hundreds of guns, items, enemies, and bosses, the options within the framework of the game become slimmer. The more interesting stuff we added in, the more difficult it became to add anything else without things breaking. After years of this steady climb in implementation complexity, adding new interesting guns and items slowed to a crawl, and became less fun to work on as it became more fragile. 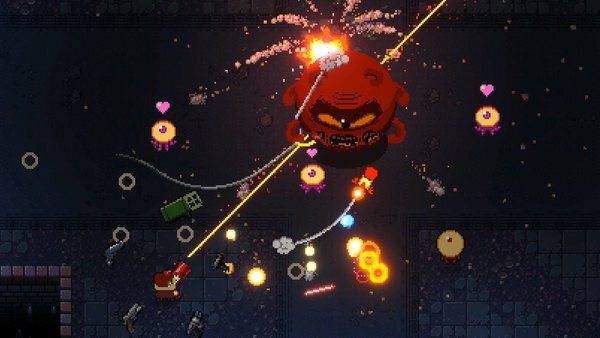 While there might not be any new content for Enter the Gungeon in the works, that doesn't mean Dodge Roll is done with the series. When asked about future projects, Crooks had to say. We are currently working on a handful of projects, none of which I can speak about in detail. 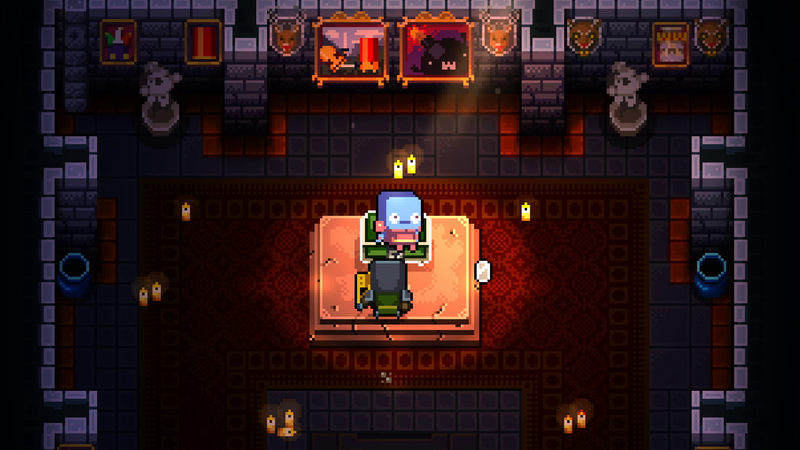 All I can say is that at least one of them is likely going to be set within the Gungeon universe. Enter the Gungeon was updated to Version 2.1.4 on Switch this week, but that hasn't stopped Dodge Roll from moving on to the next update. The team is currently tinkering with Version 2.1.7, which includes another big batch of changes and tweaks. Here's the full rundown of what the update will include. - Fixed an issue where [REDACTED] couldn’t pet the dog!! After a little bit of a wait, Enter the Gungeon has been updated to Version 2.1.4 on Switch. This patch fixes a number of issues that were introduced with the latest round of free DLC. If you are looking for a refresher on the patch or full patch notes, check out this post. The recent free content update for Enter the Gungeon seems to have caused a number of bugs and issues. Thankfully Dodge Roll is already hard at work on fixes. Version 2.1.4 has been submitted to Nintendo, and will hopefully be going live sometime this week. For now though, you can check out a list of what this patch fixes below. 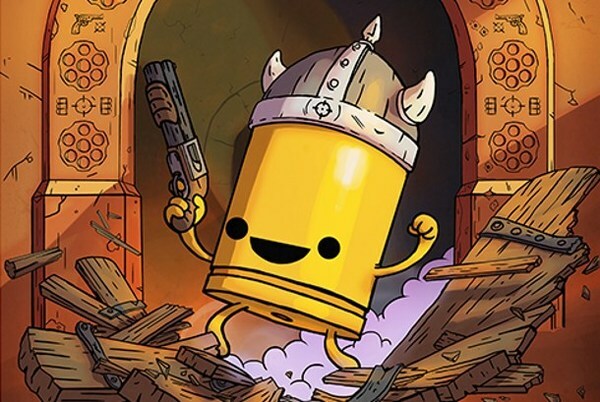 Friday, April 5, 2019 — The Gungeon – The Gungeon masters of Dodge Roll Games and roguelikers of Devolver Digital have released Enter the Gungeon’s final update, A Farewell to Arms, today on Nintendo Switch, PlayStation 4, Xbox One and PC. The teams are celebrating the three year anniversary of Enter the Gungeon’s original release and the new expansion with 50% off the game on all platforms. Enter the Gungeon initially released on April 5, 2016 to massive fanfare and overnight sensation as a smartly designed and challenging ‘bullet hell dungeon crawler’ on PC and PlayStation 4. Dodge Roll’s debut game saw additional releases on Xbox One and Nintendo Switch – all in all reaching nearly 2.5 million copies sold across all four platforms. Since the launch three years ago Enter the Gungeon has had three massive (and always free) expansions: Supply Drop, Advanced Gungeons & Draguns, and the current A Farewell to Arms. 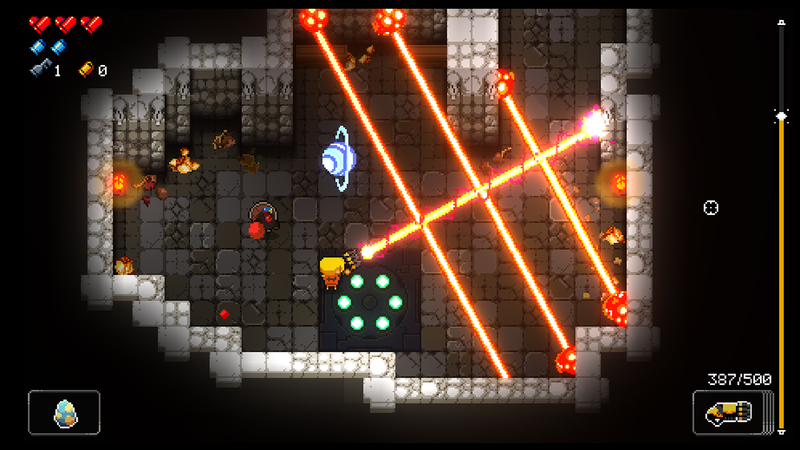 EDISON, NEW JERSEY – April 4, 2019 – Dodge Roll and Devolver Digital's ruthless bullet hell dungeon crawler Enter the Gungeon is headed to North American retailers on June 25 for Nintendo Switch, courtesy of Nighthawk Interactive. The retail edition includes all previously released downloadable content (DLC) as well as the final DLC, “A Farewell to Arms”, the exclusive “Shotgun Kin” playable skin, the original soundtrack, new collectibles including exclusive stickers, an exclusive Bullet Kin papercraft and reversible jacket artwork. This special retail package will be available for $29.99 in stores including Amazon, Best Buy, GameStop and Target. · All Digital Content and Retail Exclusives – Players can battle through all DLC, including the final DLC “A Farewell to Arms” and equip the exclusive “Shotgun Kin” playable skin. The box also comes with reversible jacket artwork and the game’s original soundtrack, limited edition stickers and an exclusive Bullet Kin papercraft. · Local Co-op – When the bullet hell becomes too hellish or if there aren’t enough bullets flying around the screen, players can grab a friend for local co-op to crusade through the Gungeon together. · The Gungeon – A constantly-evolving bullet hell fortress that blends hand-designed rooms within a procedurally-generated labyrinth bent on destroying all that enter its walls. 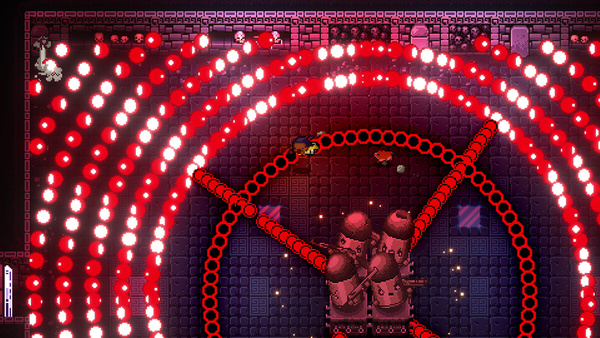 · The Cult of the Gundead – The Gungeon is littered with zealous Cult of the Gundead, disciples of the gun that will stop at nothing to defend their temple. Each enemy type wields unique firing patterns that players will need to learn in order to survive. · The Gungeoneers – Several unlikely heroes are at players’ disposal, each burdened by a deep regret and in search of a way to change their past, no matter the cost. Filled with equal parts courage and desperation, these adventurers won’t hesitate to dive across flaming walls, roll through a wall of bullets, or take cover behind whatever is around to make it to their goal alive! · The Guns – Players can discover and unlock scores of unique guns, each with its own unique tactics and ammunition. These guns can unleash everything, from the tried-and-true medley of missiles, lasers, and cannonballs to the bizarrely effective volley of rainbows, fish, foam darts, and bees. Yes, bees. Enter the Gungeon is developed by Dodge Roll, published by Devolver Digital, and will be distributed at retail by Nighthawk Interactive. Enter the Gungeon retail edition is launching on June 25, 2019 for Nintendo Switch at North American retailers for $29.99. The game is rated T for Teen (Fantasy Violence, Blood, Suggestive Themes, Alcohol Reference). 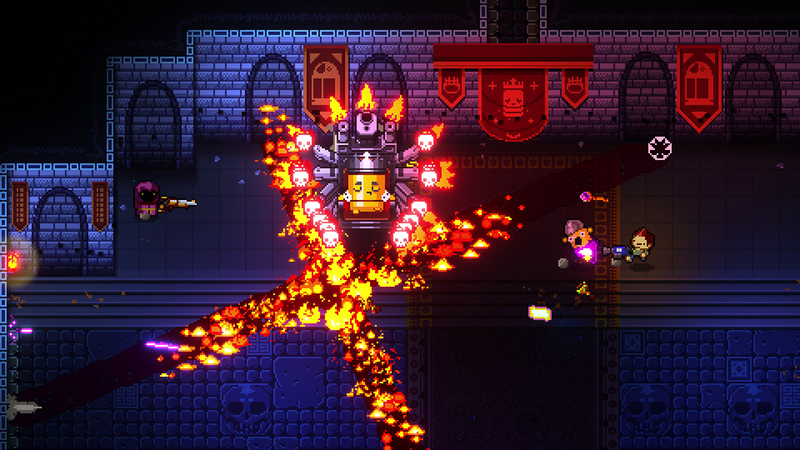 Nighthawk Interactive announced Enter the Gungeon: Ultimate Edition back in March. This release is a retail version of Enter the Gungeon, complete with the game, 4 exclusive stickers, Bullet Kin Papercraft, and Exclusive Shotgun Kin Skin. The original plan was to launch the title sometime in Spring 2019, but a GameStop listing shows that things are going to take a little longer. According to GameStop, the retail release is set for June 26th, 2019, which would be the first week of Summer. Perhaps making it worth the wait, we learn that along with all the other goodies mentioned above, Enter the Gungeon: Ultimate Edition will also include Reversible Jacket Artwork and a download code for the Original Soundtrack of Enter the Gungeon. Enter the Gungeon’s ‘A Farewell to Arms’ update brings a first to Gungeon expansions - two new playable Gungeoneers in The Paradox and The Gunslinger. Battle-tested Gungeoneers will welcome the arrival of dozens of new guns and items, a new secret floor with a new boss, and the addition of community-inspired Rainbow Mode! Additional features, tweaks and fixes keep up with the philosophy to make the player feel “more powerful, more often” implemented in the previous update. Well this is an interesting situation. Just the other day, Nighthawk Interactive announced that they'll be releasing Enter the Gungeon: Ultimate Edition. This is a retail version of the game, complete with some extra goodies. The thing is, this isn't the first we've heard of a boutique retailer offering a physical version of the game. Quite some time ago, Special Reserve Games said they'd be doing a retail release for the title. With Nighthawk jumping in with their Ultimate Edition, does that mean Special Reserve's deal is over? Apparently not, as a rep for Special Reserve says that they're still going to release a physical version. I guess that means fans will eventually have two options to choose from for their retail copy? Seems a bit strange if you ask me, but we'll keep tabs on the situation to see how everything plays out. Enter the Gungeon is a bona-fide hit on the Switch. The game has moved an impressive 2 million copies across all platforms, but the real kicker is that the game has sold over 1 million copies on Switch alone! Switch owners REALLY flocked to this title, which is why the next bit of news isn't surprising at all. Enter the Gungeon: Ultimate Edition is coming to the Switch, published by Nighthawk Interactive. 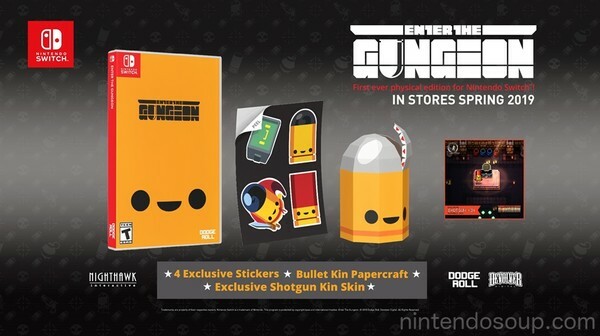 This retail release will hit the Switch sometime in Spring 2019, and includes the game, 4 exclusive stickers, Bullet Kin Papercraft, and Exclusive Shotgun Kin Skin. Enter the Gungeon: Ultimate Edition is priced at $30. Arriving at Retail for the first time, the critically acclaimed rogue like shooter(87 score on Metacritic) is here exclusively for the Nintendo Switch. Enter the Gungeon has sold well over 2 million copies to date with over 1,000,000+ copies sold on Switch alone. •This Farewell To Arms edition of Enter the Gungeon includes all DLC, Exclusive “Shotgun Kin” Playable Skin, Exclusive Stickers, Exclusive Bullet Kin Papercraft, Reversible Jacket Artwork and Original Soundtrack. •The Gungeon: Enter the Gungeon – a constantly evolving bullet hell fortress that elegantly blends meticulously hand-designed rooms within a procedurally-generated labyrinth bent on destroying all that enter its walls. But beware – the Gungeon responds to even the most modest victory against its sentries and traps by raising the stakes and the challenges found within! •The Cult of the Gundead: The Gungeon isn’t just traps and chasms – calm your nerves and steady your aim as you face down the gun-totting Cult of the Gundead. These disciples of the gun will stop at nothing to put down the heroes in their tracks and employ any tactics necessary to defend their temple. •The Gungeoneers: Choose between one of several unlikely heroes, each burdened by a deep regret and in search of a way to change their past, no matter the cost. Filled with equal parts courage and desperation, these adventurers won’t hesitate to dive across flaming walls, roll through a wall of bullets, or take cover behind whatever is around to make it to their goal alive! •The Guns: Discover and unlock scores of uniquely fantastic guns to annihilate all that oppose you in the Gungeon – each carrying their own unique tactics and ammunition. Unleash everything from the tried and true medley of missiles, lasers, and cannonballs to the bizarrely effective volley of rainbows, fish, foam darts, and bees! Yep, bees.